Ulysses. I moved to Ulysses last year, and, even after considering dozens of other options, I always come back to this app. Ulysses offers a combination of two unique features that no other text editor has: a beautiful reinvention of inline Markdown editing and powerful x-callback-url automation. I love writing and editing longform stories in Ulysses: the app simplifies management of elements such as footnotes and links with dedicated menus that abstract Markdown's syntax; in addition, I can use my custom theme and the typeface I prefer (currently, I'm editing with IBM Plex Mono). Things. My move to Things has been a hot topic of conversation on AppStories and Connected, so I won't repeat it in full, but here's the gist: while not as flexible or scriptable as Todoist, Things' design doesn't make me stress over my due tasks and it helps me cope with the anxiety often induced by having too many responsibilities. Things is incredibly polished and it looks amazing on iOS 11, both on the iPhone X and iPad Pro. The app is heavily skewed towards managing tasks in the Today and Upcoming views, though I also find myself organizing projects in sections (a feature I haven't seen anywhere else) and using Quick Find to search for tasks by title and tag. Google Docs. 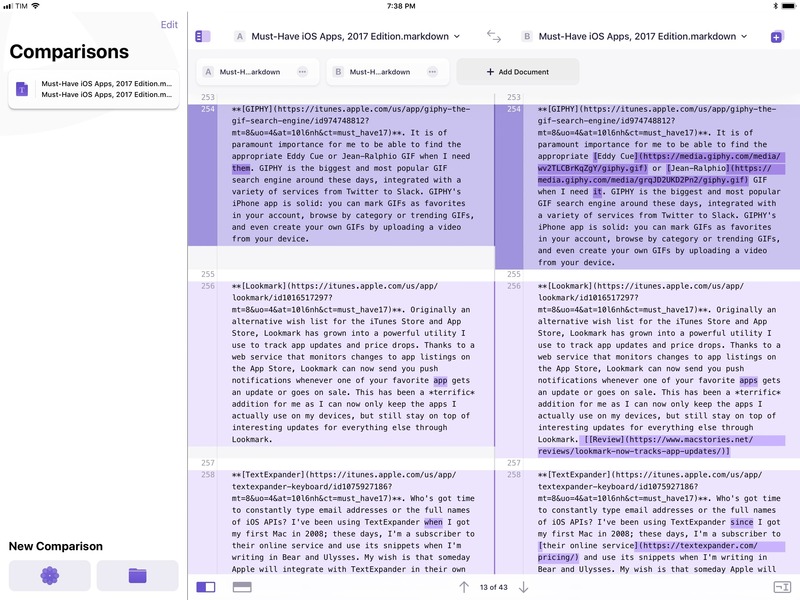 Google's collaborative word processor isn't my favorite iOS app – in fact, I often criticize the company's slow adoption of new iOS productivity features such as iPad multitasking and iOS 11 drag and drop. However, of all the similar apps and services I tried over the years, Google Docs remains the most consistent and reliable one. We use Google Docs to prepare topics for AppStories and shows on Relay FM. As an iOS app, Google Docs' interface conventions and text selection mechanism leave a lot to be desired, but I depend on it, and I can't work without it. Slack. Another case of a fantastic web service with a native iOS presence riddled with bugs. We pay for Slack at MacStories, and it's our primary communication system that has replaced email for all our day-to-day discussions. Alas, there are always some annoying bugs introduced with new versions of Slack for iOS, whether they involve scrolling performance, notifications, unread messages, or other visual elements of the app. Still, Slack the service enables us to save time thanks to integrations with other tools we use (including Zapier and MailChimp), and we even created our custom Storybot assistant to help us with scheduling team assignments and reminders. Despite its problems on iOS, I can't see the MacStories team using anything else. DEVONthink. I use DEVONtechnologies' app to store reference material for my articles and Club newsletters in the form of PDF documents and web clippings (as .webarchive files). As I explained on MacStories a few months ago, DEVONthink is an advanced file manager with terrific automation features for those who don't want to waste time manually saving documents (of any kind) into specific folders. I keep a searchable database of all our Club newsletters in DEVONthink, and I regularly use workflows to archive webpages and screenshots in the app. 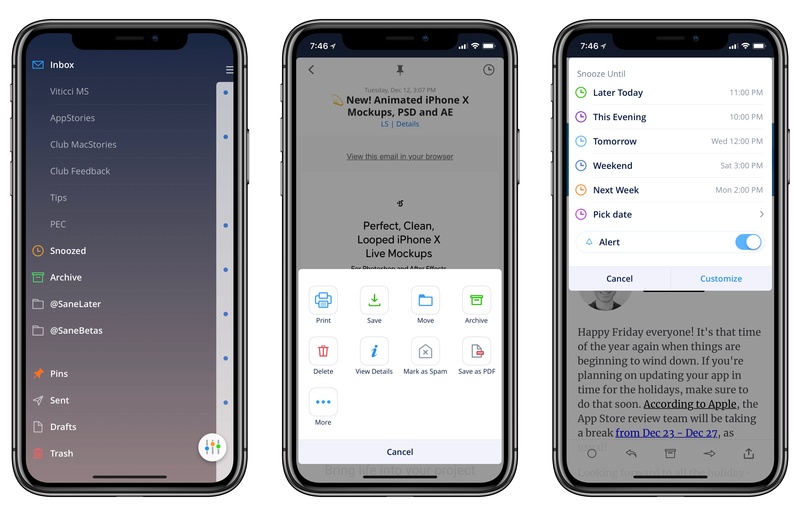 With iOS 11, DEVONthink has added support for drag and drop and Files, further speeding up how I can access and save documents from the app's databases. Working Copy. Here at MacStories, all of our posts for the site and Club sections are collaboratively edited through shared repositories in GitHub. I wrote about the decision to use GitHub for Markdown last year, and, unsurprisingly, the system has been so good for us, we haven't felt the need to try anything else. 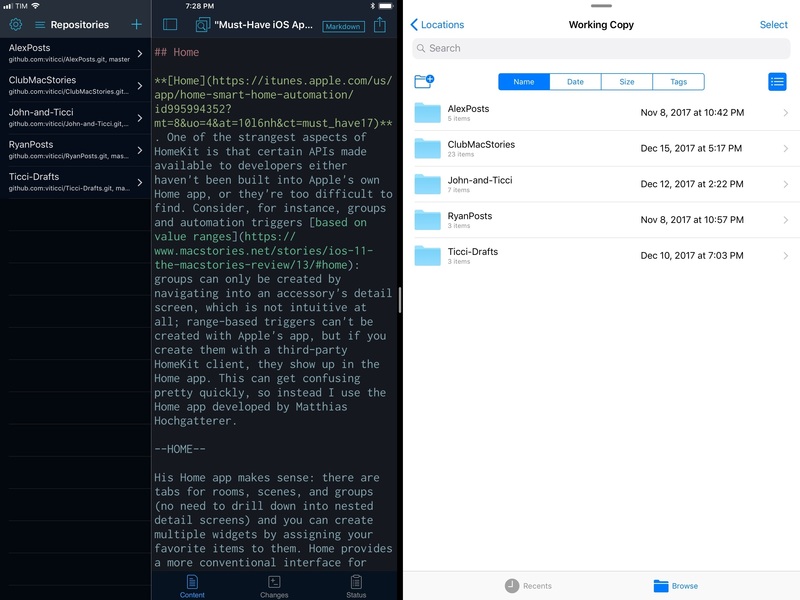 Working Copy is the best iOS GitHub client for what we need from the service: it supports Markdown syntax highlight, word-based diffs, and developer Anders Borum recently added a way to drag individual revisions of documents out of Working Copy and into other apps. Working Copy and its file provider extension. With iOS 11, Working Copy gained full support for Files with a file provider extension, which makes it even easier to save articles into repositories and open them in different iOS apps. My entire iOS 11 review was backed up in Working Copy over the course of three months, too. If you want to work with GitHub on iOS, Working Copy is the app to get. Trello. In 2017, we've continued to use Trello as an editorial calendar and organizational tool for MacStories and Club MacStories. All the sections in our newsletters are based on Trello cards that we either manually create or that are submitted by readers to Google Forms, which Zapier then converts to cards in Trello. Our Trello setup is a complex one and it involves dozens of scripts and workflows, but it's been working well for over a year now, and we trust it. 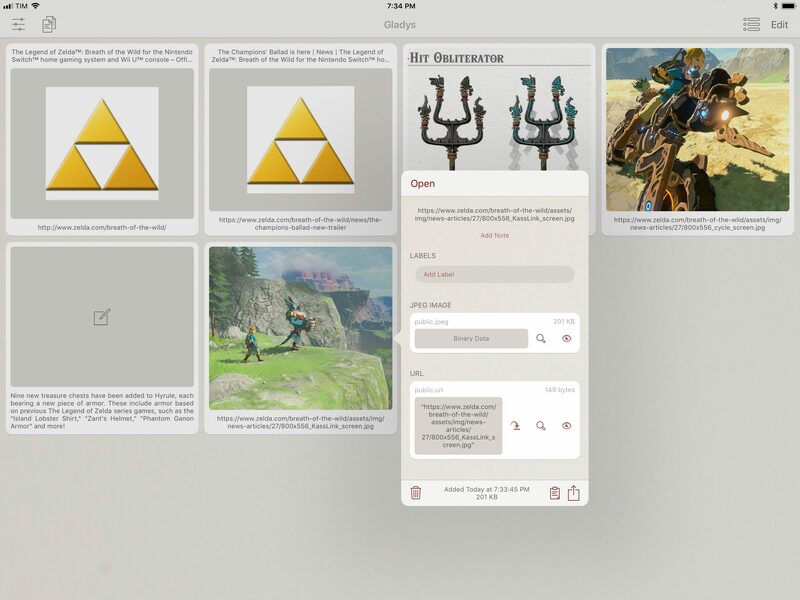 Trello's iOS app isn't great: it doesn't support iOS 11 drag and drop, for instance, but it's passable, and it gets the job done. I'm disappointed by the lack of power-ups on iPad though, and I'd like the company to bring all the features of Trello's web app to iOS. Gladys. I was hoping someone would make a third-party shelf app inspired by my iOS 11 concept after Apple announced drag and drop at WWDC, but I would have never guessed how many options we ended up having. More importantly, I could have never imagined a utility as powerful and well thought-out as Gladys. Inspecting dropped items in Gladys. Gladys lets you save anything you can drag on iOS 11 and store it in iCloud so all your items are available on both the iPhone and iPad. 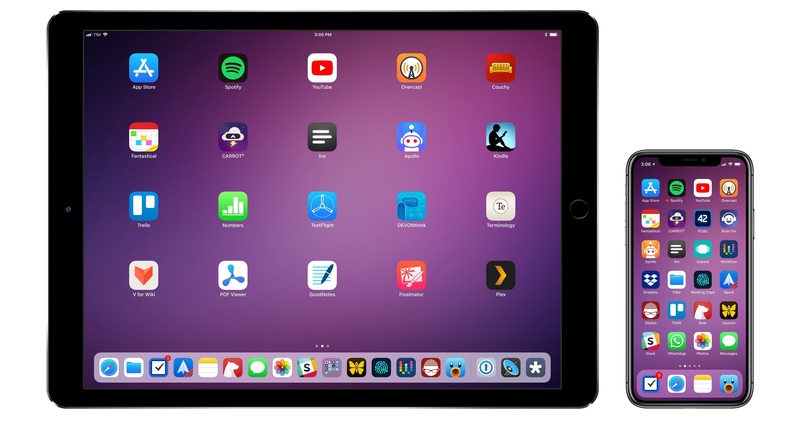 Think of Gladys as a mix of a file manager, Copied, and my idea of an iPad shelf: literally anything that is draggable on iOS 11 – whether it's text, an image, a link, or a PDF document – can be dropped in the app and stored for future usage. Ideally, you'll want to keep Gladys in the dock and use it in Slide Over, so the ability to save an item you're dragging is only a couple of taps away. Even better though, Gladys deeply integrates with the drag and drop APIs, so each item is represented with multiple versions that you can individually export and save elsewhere. Numbers. I moved to Apple's spreadsheet app last year, and while it's been a bumpy road, I'm a fan of what Apple eventually settled on. Numbers now integrates with drag and drop and Files' document browser, which gives its main view a consistent set of recently opened documents as well as access to every spreadsheet stored elsewhere on the system. I'm still using Numbers to track expenses with historical currency conversions; John and I use Numbers' built-in iCloud collaboration to track sponsorship sales and other business-related tasks. More recently, I used Numbers to visualize battery charging stats for the iPhone X, and I discovered that some of the advanced chart editing features still aren't available on iOS. I'd like Apple to bring full feature parity between Numbers for Mac and iOS next year. Dropbox. As much as I've tried to consolidate all my file management habits and workflows in iCloud Drive since the advent of Files with iOS 11, there are several things that Dropbox simply does better than iCloud Drive, or that Apple isn't interested in supporting altogether. Dropbox allows me to easily share files as well as entire folders with other people just by generating a shareable link; this is only partially supported by iCloud Drive, and it's not as intuitive either. Dropbox can keep track of file versions, has an API that integrates with Workflow, and it's cross-platform. I love the simplicity of iCloud Drive (which has been working well for me), but I also need the versatility of Dropbox. Thankfully, the service now offers a native Files extension on iOS 11, which gives me the best of both worlds – Apple's UI and Dropbox's excellent service. Spark. This year, I have come to the conclusion that the email client of my dreams doesn't exist. 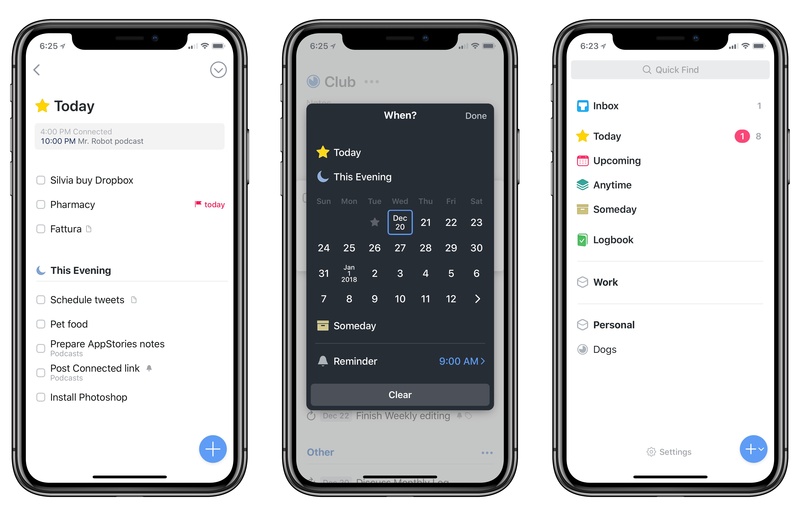 I'd love to use an email client that has Airmail's customization and app integrations, the fluidity of Apple Mail's interface, the search prowess of Gmail, and the team collaboration features of Polymail. This beautiful Frankenstein monster of an email app will probably never be made, which I understand as I have very specific preferences. iThoughts. I would have liked to give MindNode 5 a try this year, but, unfortunately, two issues keep me from using the app's latest version: its theming options don't allow me to make the kind of wireframe layout I like my mind maps to have, and an unspecified iCloud bug prevents MindNode from uploading documents stored in its iCloud Drive container. This is how I like my mind maps. 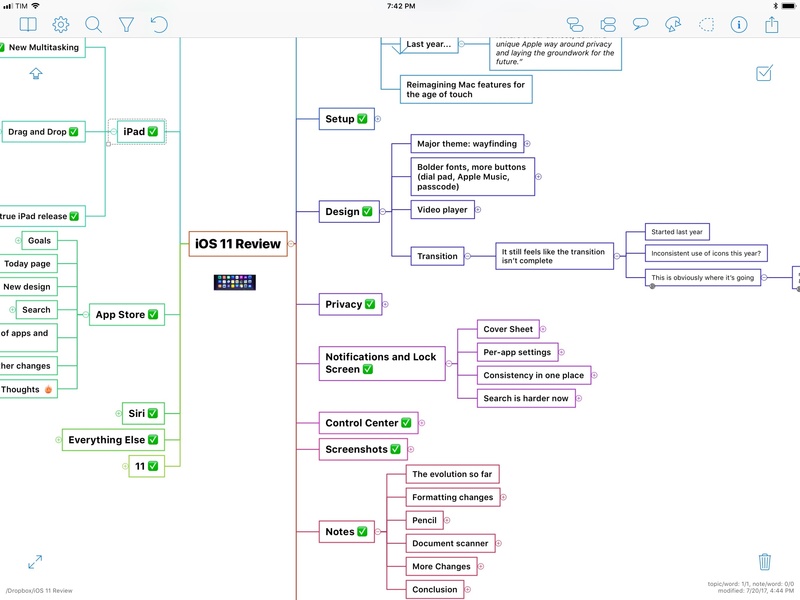 iThoughts, while not nearly as gorgeous or integrated with iOS 11 as MindNode 5, does what I need: my mind maps have a sharp-angled look with different weights and styles of San Francisco for each level, and they're synced with Dropbox. If MindNode gains deeper styling controls and if the developers can figure out my iCloud Drive issues (which I only have with MindNode on all my devices), I'd like to see if it could replace iThoughts to outline my iOS review next year. Kaleidoscope. This was one of my favorite surprises of 2017. 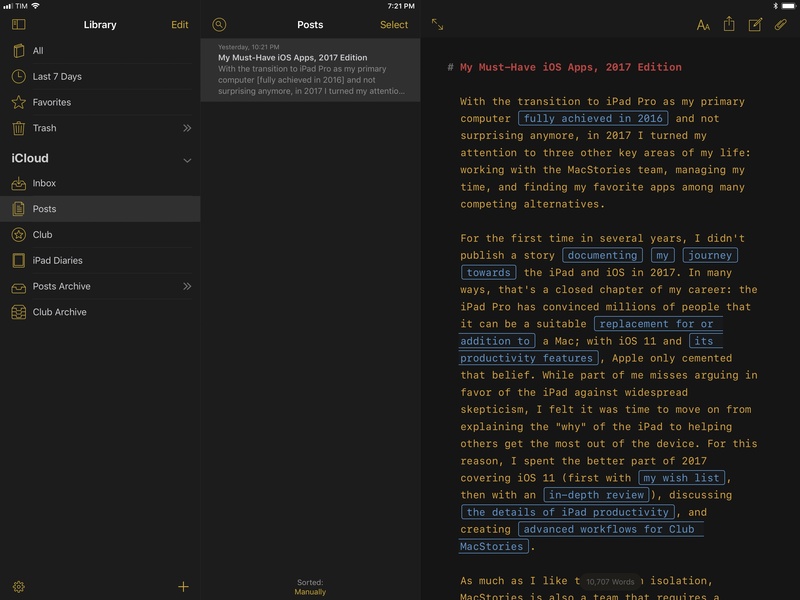 The folks at Black Pixel have brought Kaleidoscope's powerful diff functionalities from the Mac to iOS, crafting a polished text comparison tool that integrates with iOS 11's Files app and drag and drop. Ever since its release in September, I've switched to using Kaleidoscope to keep track of changes in document revisions for all the documents we share with the team on GitHub. The ability to drag out individual versions of an article from Working Copy and drop them into Kaleidoscope is exactly what I needed when comparing edits suggested by Ryan and John against my drafts. Kaleidoscope's split-screen design is brilliant, and if you also need to track changes to Markdown text files over time, I can't recommend it enough. Textastic. Speaking of editing plain text files stored in Working Copy, it doesn't get any better than Textastic's ability to bookmark individual repositories as fast-access folders. Thanks to Files' document picker and Working Copy's document provider, I can pin team repositories in Textastic and make changes to Markdown files using the app's superior text editor. Edits from Textastic are mirrored in Working Copy – no need to manually save or duplicate files after editing them. I don't take advantage of Textastic's more advanced features, but as a front-end to Working Copy's GitHub repositories, it's perfect for my needs.